Scott and Michelle Lyons planned to move to Mexico when their kids went to college. But when Michelle went on a cruise that stopped in Belize…their plans changed. “When I discovered that English was the language in Belize, I knew I had found something that would work for us,” says Michelle. The impossibly blue waters, soft sandy beaches, and wonderfully warm climate of beautiful Belize also helped win the couple over. From the sparkling sea filled with palm-lined islands to the verdant jungles teeming with wildlife, Belize beckoned with an enticing blend of relaxation and adventure…a tropical paradise. 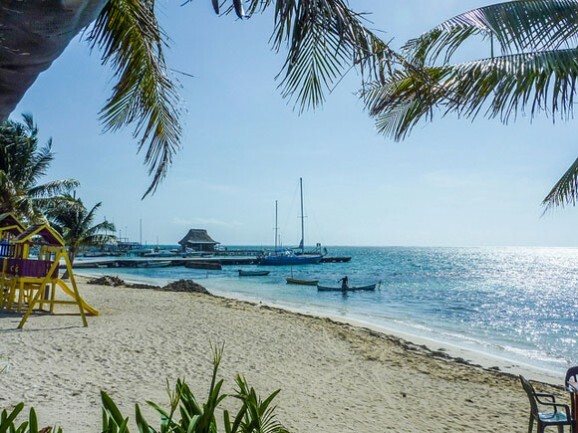 These days, they enjoy a much more relaxed lifestyle and Belize is so affordable that the Lyons keep two homes there…one on the mainland and one on the tropical island of Ambergris Caye with its white-sand beaches. They chose San Pedro, on Ambergris, to set up a shipping business which helps expats to relocate, and built an apartment there for themselves to enjoy. When they’re on the island, they take full advantage of life on the water.